Due to the popularity of this post (the fact that you’re reading it), please set yourself an alert to check back at BLCH by the end of April. I’ll be doing an annual blog post as soon as the information is available on when the plant give-away weekends take place across various parts of Montreal. I’ll do my best to find out when it is at least by the first weekend in May — which is when you might want to go shopping for seedlings, anyway. It’s also the weekend that some boroughs of the Ville are giving away plants to residents for their balconies and yards. I’m off this morning to collect flowers – it’s my borough’s weekend – but pretty much ALL of them give flowers and compost away every year. Call 311 for your area. The giveaway usually begins at 10 AM, with a few (3 – 4) locations for each borough. They are not well-advertised because even without advertising, they still draw a huge crowd. Bring a pail for your compost and a sturdy bin or bags for your plants. Arrive early; the line-ups are usually an hour long. Pull up the plant in its entirety and hang it upside down in your garage or cold cellar. 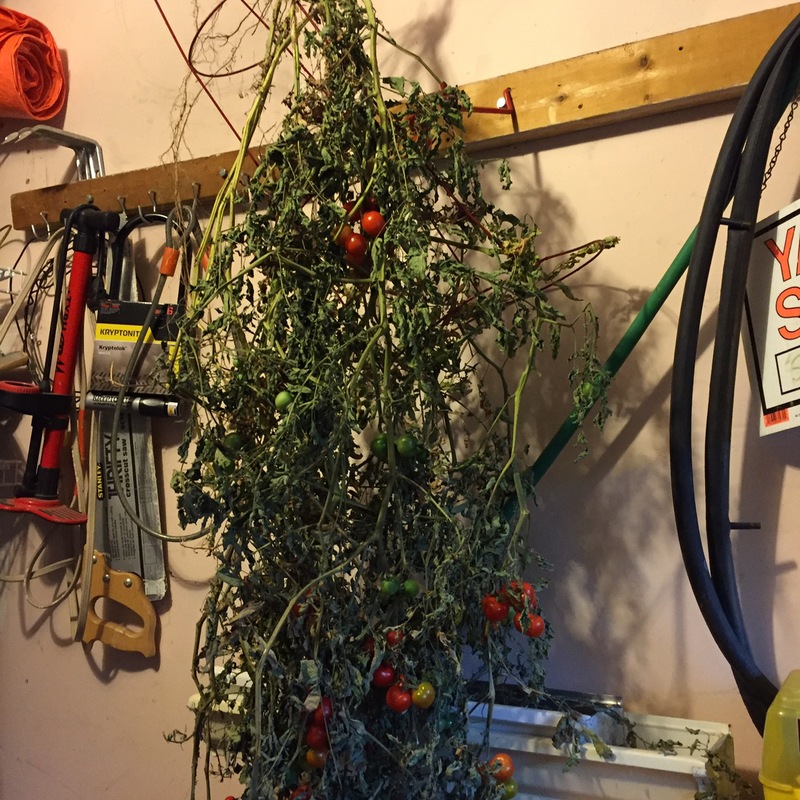 All the cherry tomatoes on this plant – and there were many more; I’ve harvested them regularly – were green when I pulled it up at the end of September. I’m getting a lot more than I thought possible – at least 40 off of 3 plants! It’s not too late to start your native, urban garden! If you’ve had a frustrating spring with all this rain and insufficient heat, don’t despair. You can still have a garden this summer. Here are some resources to help you – especially those of you in Montreal, Quebec, and eastern Ontario, where most of these resources can be reached. If you’re francophone or able to read French, download the Guide potager urbain, written by the couple from Drummondville who were given a legal hassle in 2012 about having a front yard full of vegetables. This 240-page e-book is a handy guide to having a very attractive and productive garden. While deciding what it is you want in your garden, double-check your zone (Montrealers: we are in Zone 5). See if it’s something that can be planted in the middle of June for a harvest in a short timeframe, up until October. Here are the next steps:Vegetable seedlings are now well past their prime at the greenhouses where they’re sold. You’ll be able to buy a few on sale. Get them into the ground or into wicking or standard pots as quickly as possible. Make sure that compost and peat are part of the soil mix, and water them every day if the rain doesn’t come.